Designed by architect James H. Dakin, Louisiana’s Old State Capitol in Baton Rouge is among the state’s most distinctive architectural landmarks. Built between built between 1847 and 1852, it was constructed to house the Louisiana state legislature when the state capitol was moved from New Orleans to Baton Rouge. 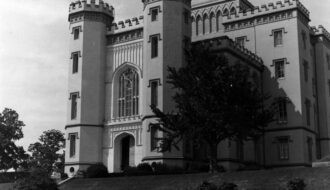 It is one of only two state capitol buildings designed in the Gothic Revival style, the other being the Georgia state capitol completed in 1841. 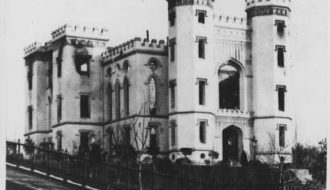 Occupied by Union troops in the Civil War and partially destroyed by fire and then neglect, the building underwent a series of renovations restorations. Still standing on its monumental site—a bluff above the Mississippi River—the building currently provides a home for the Museum of Political History. Construction on the building began in 1847 when the state approved New Orleans architect James Dakin’s plans for the building. As stipulated by the state legislature, the capitol was not to cost more than $150,000 and would have to be occupied by January of 1849. 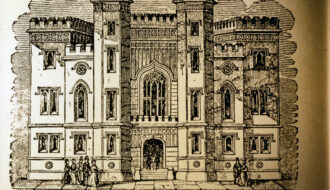 Though the building officially opened on January 28, 1850, work on the interior continued until 1852. Dakin’s design placed the House and Senate chambers on the second floor at the east and west ends of the building. Between them was an elliptical rotunda, capped by a stained-glass dome. 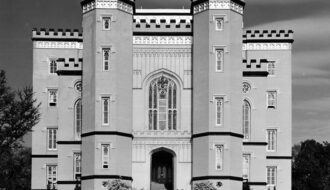 Paired octagonal towers flank the central entrance on the building’s western wall, and are echoed in the paired square towers on the east front. Windows into the two major chambers are topped by lancet arches, a major element of Gothic Revival architecture. The entire roofline is crenellated or notched, recalling European castles built in the Middle Ages. 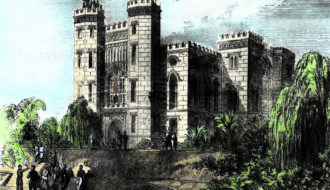 In the written statement submitted with his plans, Dakin described his design as “Castellated Gothic.” He argued against the use of the Greek or Roman Revival style, then often employed for large public buildings, because he felt that they were not well suited to the demands of such a complex structure. 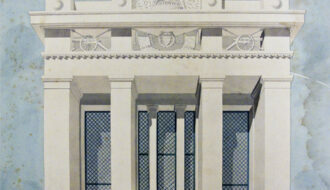 Moreover, if designed in those styles, the capitol would merely imitate earlier buildings. His unique design, however, was not without its critics. 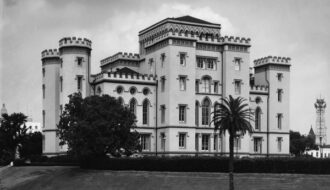 Writer Mark Twain, for one, famously called the building a “little sham castle” that indicated Louisianans were reading too much romantic literature by Sir Walter Scott. Despite the design controversy, the Old State Capitol housed the Louisiana legislature until December 28, 1862, when it was occupied by Union troops during the Civil War. During the occupation, a cooking fire consumed the interior of the building, leaving only the exterior walls standing. It stood in this condition for more than eighteen years, when in early 1880, Governor Louis Wiltz hired architect William A. Freret to direct the building’s restoration. 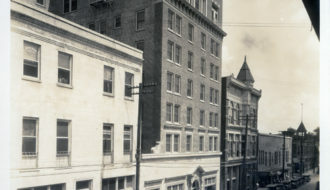 Technically, Freret oversaw a grand remodeling of Dakin’s building rather than a true restoration. Because Dakin’s design had been criticized as being too dark, Freret enlarged the rotunda and covered it with a cupola of clear glass. 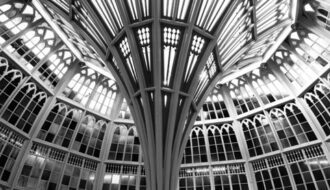 Beneath it he placed a stained-glass vault, framed by cast-iron ribs that supported by a massive cast-iron column. Freret also added a cast-iron spiral staircase that rises from the first to the second floor. Perhaps the greatest employer of cast iron in nineteenth-century Louisiana architecture, Freret had designed a number of elaborate cast-iron fronted commercial buildings in New Orleans. Although it took almost a decade to complete, the remodeled state capitol was favorably reviewed in one of the most important architectural journal of its day, The American Architect and Building News. In 1932, the Louisiana state government moved from the Old State Capitol into the New State Capitol designed by Weiss, Dreyfous and Seiferth. The abandoned capitol served as office space for a variety of organizations, including the Works Progress Administration in 1936. Gradually, however, the building fell into disrepair. A series of restorations began; however, in 1991 the building was threatened with demolition. In a four-part restoration process, a damaging layer of cement was removed from the building’s exterior. The six-foot, cast-iron fence surrounding the building, originally designed by Dakin and cast at the John Hill Foundy in 1855, was also restored. Completed in 1994, the restoration, overseen by E. Eean McNaughton Architects, won an American Institute of Architects Honor Award in 1998. 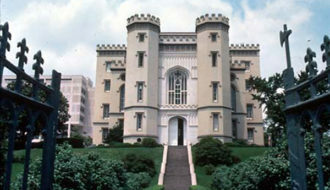 The Old State Capitol currently houses the Museum of Political History. Ferguson, John C. "Old State Capitol." In https://64parishes.org Encyclopedia of Louisiana, edited by David Johnson. Louisiana Endowment for the Humanities, 2010–. 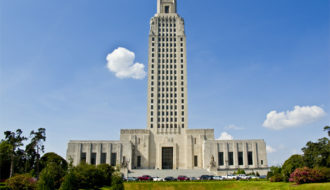 Article published February 1, 2011. https://64parishes.org/entry/old-state-capitol. Keister, Kim. 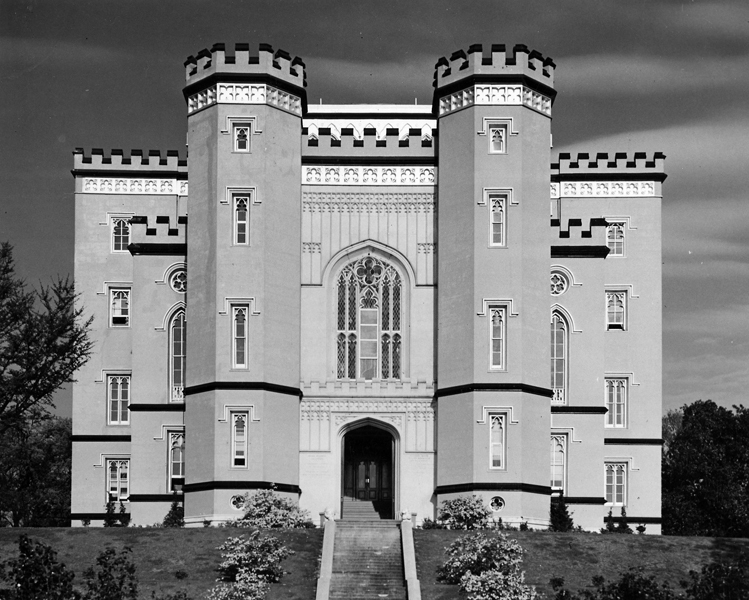 “Capital Castle.” Historic Preservation 46, no. 3 (May–June 1994): 36–45, 93–95, 98. Scully, Arthur Jr. James Dakin, Architect: His Career in New York and the South. Baton Rouge: Louisiana State University Press, 1973. "Old State Capitol in Baton Rouge Louisiana"